She may be all sugar and spice but she also has a wicked grind she loves showing off! She lives for those heelflips, showing the boys she can pull off an ollie with the best of them and stay adorable at the same time. Your birthday girl will love grabbing some air in this custom shirt! 6-6.5 oz 100% combed cotton shirts fit great and feel amazing! 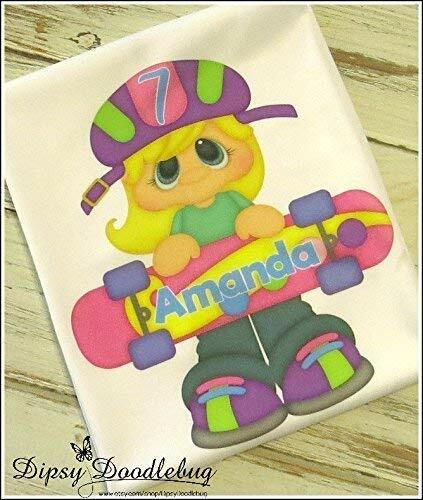 Created with specialty commercial grade graphic transfers, this design is created to last as long as your child will want to wear it! Machine wash cold or warm water, inside out to best preserve the print. Please use a Color Catcher the first few washes, NO BLEACH or FABRIC SOFTENER. Remove from wash promptly. Tumble dry low. Do not dry clean. If ironing is needed please avoid the design area to prevent damage! For your convenience, I have provided a size chart within every listing to aid you in choosing the right size to ensure a proper fit for your child. PLEASE refer to these size charts.